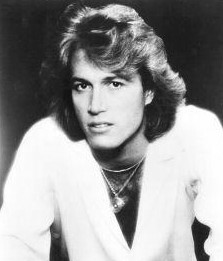 Andy Gibb rose to the top of the pop heap starting in 1977 with his first single “I Just Want to Be Your Everything,” followed by “(Love Is) Thicker Than Water” and 1978’s “Shadow Dancing.” His first three singles all shot to number one, a feat that Justin Beiber, or anyone else for that matter, cannot claim. He was 19 years old at the time. Andy had a pretty-boy face and a killer smile tailor-made for magazines like 16 and Tiger Beat. To top it off, he could actually sing, and his voice was somehow eerily familiar. This probably had something to do with the fact that Andy was the kid brother of the world famous Brothers Gibb, better known as the Bees Gees. Andy’s success was both immediate and immense. He was either ill-equipped to deal with his new-found fame or hell-bent on self-sabotage – either way, he sought solace by burying his face in huge piles of cocaine. He was briefly married for a time and fathered a daughter, but much like his career, this relationship was over before it started thanks to his growing cocaine addiction. Then, in 1981, things began to look up for Andy. He was offered the job of co-hosting the popular TV program “Solid Gold” with Marilyn McCoo. More importantly, he met actress Victoria Principal, one of the stars of the popular show “Dallas,” and fell crazy in love. Our breakup was preceded and precipitated by Andy’s use of drugs. I did everything I could to help him. But then I told him he would have to choose between me and his problem. From that point on, Andy flailed and stumbled both personally and professionally. Every opportunity presented to him, including roles in “The Pirates of Penzance” and “Joseph and the Amazing Technicolor Dreamcoat,” he lost due to his addiction to cocaine. He was on a dizzying downward spiral, in and out of rehab centers, until he finally found himself jobless and bankrupt. Andy was living on his brother Robin’s estate in Oxford, England, trying to get on the straight and narrow and attempting to put an album together. His mom had come to cook and care for him, and the two of them quietly celebrated his 30th birthday on March 5, 1988. When we hear about young people, otherwise healthy, having a heart attack, the most likely scenario involves drugs and drug use. When he died, it had nothing to do with drugs at all. But the damage had been done through drugs in the first place.